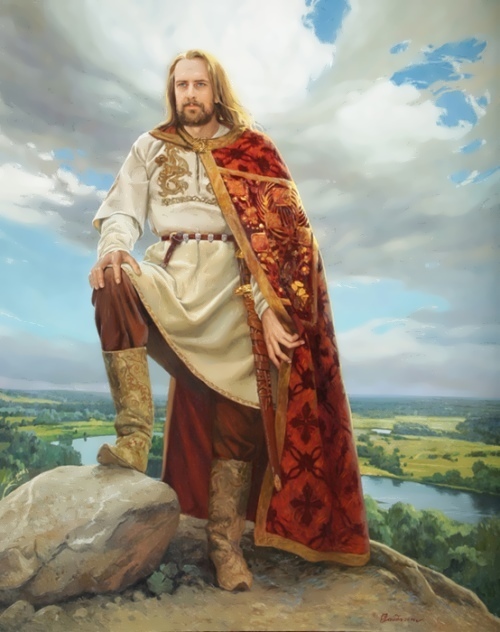 Also called Iaroslav, or Yaroslav Mudryi in Russian, Yaroslav the Wise was grand prince of Kiev from 1019 to 1054, one of the brightest representatives of the Riurykide (Rurikovich) dynasty, who was best known in eastern European history as a powerful leader of the early centralized Kievan Rus state. He was the son of Grand Prince Vladimir I (Volodymyr) (Vladimir the Great). He is also recognized as a skillful administrator, military leader, and diplomat who put the Kievan Rus state on the political map of medieval Europe as one of the important powers of his era. At the end of Yaroslav’s rule in Rostov (c. 988–c. 1010) the new city of Yaroslav (about 100 miles from Rostov) was established in his honor. He was then sent to rule the city of Novgorod in the northern part of Kievan Rus. Yaroslav preferred to use Viking (Varangian) mercenaries in Novgorod (the Riurykide dynasty, in fact, was of Viking descent). The Vikings, the privileged and favorites of the prince, were cruel and violent toward locals. In 1014 Yaroslav decided not to pay tribute to his father, Grand Prince Vladimir. The angry father prepared to fight his son but soon died of illness. After the death of Vladimir, his eldest son, Svyatopolk, decided to win the throne of Kiev. To prevent his brothers from ascension to the throne, Svyatopolk killed Boris, Gleb, and Svyatoslav and acquired the throne. 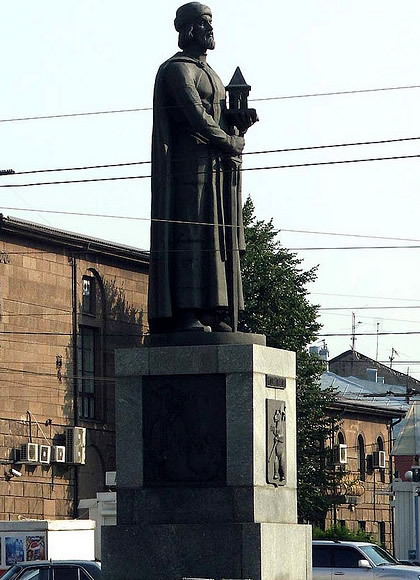 Svyatopolk, who became known as the Accursed (Okayannyi in Russian) for killing his own brothers, was very unpopular among ordinary citizens, soldiers, and the nobility in Kiev. Yaroslav, whose life was spared by the distance between Kiev and Novgorod, challenged Svyatopolk. He relied greatly on the help of Viking mercenaries as well as on citizens of Novgorod who were more than happy to assist him in his battle against Svyatopolk the Accursed. After a long battle with Svyatopolk, Yaroslav defeated him and seized power in 1016. Svyatopolk escaped to Poland. The Polish king Boleslas, interested in helping Svyatopolk in exchange for territorial concessions, sent his troops to Kiev. Yaroslav was defeated in a bitter battle in 1017 and escaped to Novgorod. By 1019 he gathered more troops from Novgorod. In a decisive battle he defeated his brother and became the grand prince of Kievan Rus . It took him about two decades to assert his authority over some remote parts of his country, since he fought with another brother, Mstislav. From 1036 Yaroslav was the sole ruler of Kievan Rus. Yaroslav ruled Kievan Rus for about 35 years, consolidating political and economic power and making the city of Kiev one of the greatest cultural centers in eastern Europe. He was notable for his military achievements, as he defeated the powerful and destructive nomadic Pechenegs on the Kievan southern frontier in 1036–37. In a series of campaigns on the western frontier in the 1030s and 1040s he weakened the Polish state, won the province of Galicia from Poland, and expanded his possessions in the Baltic region by subduing Estonians, Lithuanians, and other tribal confederations. He also attempted to challenge the political dominance of the Byzantine Empire in southeastern Europe but was defeated at Constantinople in 1043. The cultural and religious development of Kievan Rus was greatly advanced by Yaroslav during his rule. He promoted the spread of Christianity, which was formally introduced by his father, Vladimir, in 988. A considerable number of religious and some secular books were brought from the Byzantine Empire and were translated from Greek to the Old Slavonic and Old Church Slavonic languages. It is important to highlight that the close religious ties of Yaroslav with the Byzantine Church contributed to the future isolation of Russia from the Roman Catholic Church and consequently from Latin civilization. Yaroslav understood the significance of art. He encouraged Byzantine artists and artisans, especially architects, to settle in his capital. New churches were built, and the first Russian monasteries were established during the reign of Yaroslav to signify the central role of the Christian church in the state. The monumental cathedral of St. Sophia and the Golden Gate of the Kievan Fortress became the most famous examples of the Kievan architecture. Under the order of Yaroslav, the country’s legal system was codiﬁ ed and completed with publication of the legal code called Yaroslav’s Justice (Pravda Yaroslava in Slavic). Yaroslav was continuously replacing tribal leaders with his own associates and vigorously persecuting pagan leaders and suppressing paganism. These actions further contributed to transformation of the East Slavic tribal confederations into a dynamic feudal state and strengthened positions of the religious clergy in the political affairs. In 1051 Yaroslav appointed the local metropolitan Illarion for the first time without the participation of Constantinople. Yaroslav pursued a very active foreign policy; he supported and promoted international trade. Russian merchants successfully traded as far as the Byzantine Empire, France, Hungary, Norway, and Persia. He built alliances with several central European and western powers through dynastic marriages, as his daughter Elizabeth was married to Harald III of Norway, daughter Anna to Henry I of France, and Anastasia to Andrew I of Hungary. Yaroslav was married to a Swedish princess and his sister married a Byzantine prince. This cemented the high prestige of the Kievan Rus state, and Yaroslav’s dynasty in Europe. Yaroslav died in 1054, respected as a successful builder of the centralized Kievan Rus state. In his will he divided his domain among his five sons, entrusting the Kievan throne to his eldest son, Izaslav. However the state was ripped apart very soon after Yaroslav’s death by his ambitious, but not farsighted sons.